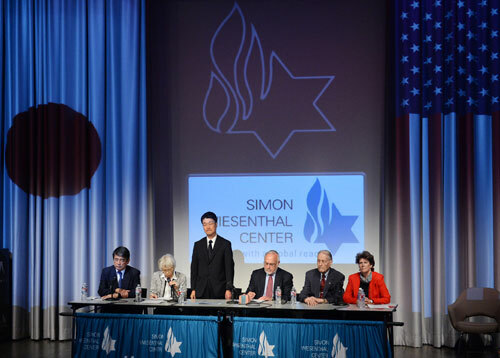 On July 19, Hikaru Kimura, a senior official of Japan's Mitsubishi Materials Corp. apologized for using U.S. prisoners of war (POWs) as forced labor during World War II (WWII) during a special ceremony at the Los Angeles-based Simon Wiesenthal Center. Kimura expressed remorse for the tragic events and asked for forgiveness for the delayed apology. The 94-year-old James Murphy from California, who survived working at Mitsubishi's Osarizawa Copper Mine, accepted the apology on behalf of other former U.S. POWs. Murphy was the only serviceman able to make the ceremony in Los Angeles. Six POW camps in Japan were linked to the Mitsubishi conglomerate during the war, and they held a total of 2,041 prisoners. Mitsubishi had forced around 900 U.S. prisoners to work in four copper mines. Actually, in 2009, the Japanese Government issued an official apology to U.S. POWs, and again in 2010. 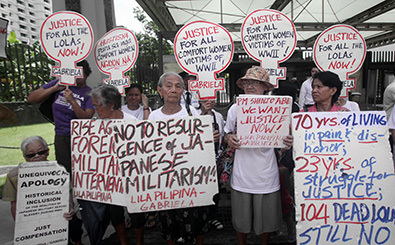 However, before the apology from Mitsubishi, the dwindling ranks of these veterans have gained little traction in their demand for apologies from Japanese corporations that forced them as laborers at mines and industrial plants under often brutal conditions. By far, only two living survivors of that ordeal could be located to accept the apology. Of them, only Murphy was fit enough to make the trip to Los Angeles. The veteran said, "This is a glorious day. For 70 years, we wanted this." He also hopes that Mitsubishi's move may enlighten other Japanese corporations that committed the same crime. Mitsubishi's apology to the U.S. forced laborers has also brought back the painful memories of those Chinese people who also suffered the same miserable treatment. In a press conference on July 24 in Beijing, Tong Zeng, head of China Federation of Civil Claims Against Japan (CFCCJ), presented a draft version of an "apology letter" to Chinese forced laborers offered by Mitsubishi. The letter admitted that, according to a Japanese Government report, about 39,000 Chinese nationals were forcibly taken to Japan during WWII to work in coal mines and on construction sites. Among them, 3,765 were forced to work in 12 mining sites belonging to Mitsubishi Materials, while 720 of them died at the time due to harsh conditions, and only 1,500 survivors or relatives have been found. Since the 1990s, those Chinese forced laborers who finally returned to China after the war, such as Liu Lianren and their relatives, started their efforts to file a lawsuit against the Japanese Government for apology and compensation. But all of their lawsuits have failed. 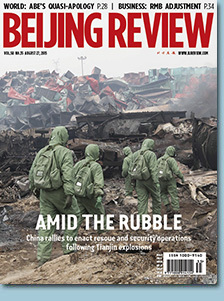 On March 18, 2014, Beijing No. 1 Intermediate People's Court formally accepted a lawsuit against Mitsubishi from 37 former forced laborers from Beijing. This was the first time that Chinese court decided to take up compensation lawsuits against Japan. Since then, a string of compensation lawsuits related to wartime-forced labor in Japan have been filed in China. Currently, there are less than 700 forced laborers that are still alive. According to a recent report from Japan's Kyodo News, Mitsubishi has reached a consensus with CFCCJ that the former will present an "apology letter" as well as compensation to Chinese forced laborers before August 15. Rabbi Abraham Cooper, Associate Dean of Simon Wiesenthal Center, is the pushing hand of the Mitsubishi's apology move. Cooper is also a renowned Jewish human rights activist. In the past 30 years, Cooper and his Simon Wiesenthal Center as well as the Museum of Tolerance have been committed to hosting exhibitions socially useful activities to have the public learn about the sufferings of the Jewish people during the WWII and push tolerance and mutual respect culture around the world. In an exclusive interview with Beijing Review, Cooper said, "A cornerstone of the Jewish people is ourcommitment to memory. Remembering the past, the bad as well as the good, is an important prerequisite for a hopeful and positive future. Simon Wiesenthal, the late Nazi hunter, sought accountability, not vengeance." Cooper believes that the 70th anniversary of the end of WWII in the Asia-Pacific presents an important opportunity for Japanese companies to step up and act. "Mitsubishi Materials did so, and we were honored to serve as the venue for that long-overdue apology. We believe that other Japanese companies must act quickly before the remnants of those who suffered at the Japanese Imperial forces die out," said Cooper. Cooper added that the apology given at the Wiesenthal Center showed that the apology comes late but not "too late," emphasizing that forgiveness needs to come on the part of the victims and that workers should be compensated to portray accountability. Unlike post-WWII Germany, Japan was never forced to confront its past or try war criminals in their midst. "It is a shame that the past remains such a contentious issue for so many Japanese," Cooper told Beijing Review. "Yet, it was Japanese activists, like Kinue Tokudome who took the lead in urging Japanese firms to do the right thing. That is a hopeful sign. Japanese Prime Minister Abe made an important speech about remembering the past at Israel's Yad Vashem. We are hopeful that his statements about the 70th anniversary of the end of WWII will continue in that vein and help contribute to an environment based on trust." When referring to the contribution that the Chinese people had made during the WWII, the associate dean said that the Chinese people were already confronted with a brutal war that began in 1931. Unfortunately, most American people were almost totally consumed with domestic crises during the 1930s. It took Pearl Harbor to finally and officially waken the Americans to the threat that the Axis Powers posed to the world. "The American people were always sympathetic to the profound suffering of the Chinese people," said Cooper.